If people expect the forces of darkness to just roll over and give back the world to a bunch of losers with wings, they are sorely mistaken. 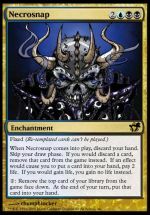 Demons, devils, spirits, werewolves, zombies and vampires have enjoyed free reign on Innistrad for a long time, and they like it just the way it is. What’s more, they know a thing or two about fighting dirty. They’ve got a few tricks up their collective sleeves that no-one quite expected. Here’s one of them. If your first reaction on seeing this card is “black can’t do that,” then you obviously have not spent much time hanging around black mages. Black is the colour of breaking rules. When black is forced into a corner, you can bet it will do everything it “can’t do”. Black will do anything to win. So while you might be right in thinking that black is not the colour of dealing damage to flying creatures, black definitely is the colour of slaughtering angels, and that is exactly what Horrorcane is best at. Black is also the colour of eating the last piece of the pie, so if green is going to leave a slice lying around, what does it expect to happen?